I want (Prada) Candy. Or do I? Now, this is an interesting one. 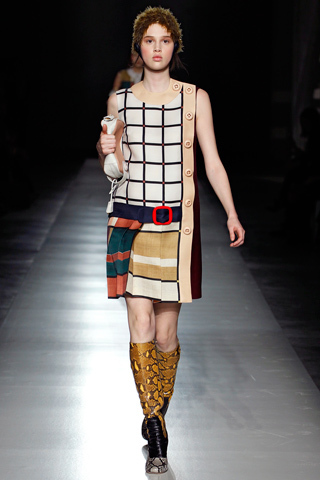 Prada’s been confusing me greatly for the past few seasons. 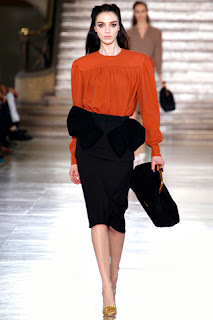 Miuccia hit the home run in with her genius A/W ’10 ‘Mad Men’ meets ’50s jazz beatnik collection and sent outfit after covetable outfit down the catwalk that was replicated by high street brands the world over. 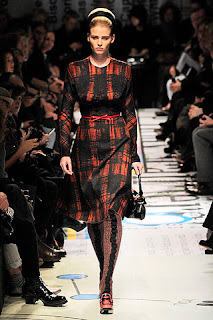 The ladylike attire, the texture clashing, the use of distinct prints and expanses of must-have daywear were all typically the Prada we know and love. Then, we hit Spring ’11 and it was dayglo Josephine Baker’esque and pattern and stripe explosion ‘fest (why?) shortly followed by this season’s 360 degree move to ’20s meets ’60s Mondrian inspired flappers, and , though there were undoubtably stellar pieces, these last two collections have felt deliberately younger and funkier…as if Prada were ditching the stalwarts that made them and focusing on a younger trend led demographic. Meanwhile back at the ranch, the (previously known as) diffusion line Miu Miu (pictured below) continues to deliver assured and quirky lady-like poise and swagger and, conversely, would now be my first port of call versus Prada. How times have changed. Which brings me to Prada Candy. This mischievous upstart is bound to surprise a fair few with its leap to Channel 4 presenter type joi de vivre and emphasis on girly coquettishness. Firstly, there’s the packaging with its bottle-blonde girl illustrative character tripping on the front of a Schiaparelli fuchsia pink box highlighted by black and gold. Then there’s the bottle, round, cutesy and glowing golden amber and brilliant pink with an R2D2 type spray lid. This is certainly different, eye-catching and pungent for a brand hewn youth market who like to play. 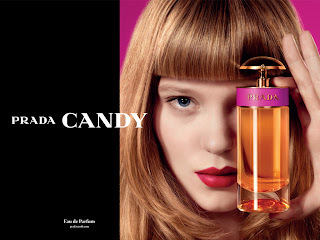 In the print advertising image, rising darling of French cinema, Léa Seydoux holds a bottle of Prada Candy provocatively over her eye, her vermilion lips clashing with the bottle. Then, in the film ad, the iconoclast creative, Jean-Paul Goude directs the Prada Candy movie while Seydoux’s hypnotic type dance is inspired by the Apache dance performed by the street gangs of Paris in the 1900’s. This launch will have the full marketing onslaught to push this bright and poppy newbie upon a hungry market in time for Christmas but is it what it’s cracked up to be? Conversely, on first spray, this struck a memorable fragrance memory: of mum or gran’s powder puff compacts and the sweet, comforting, homely scent of safety and femaleness. Then, the soft scent seeps into your skin, like cloying sugared almond little strumpets, enveloped in their pastel hewed clothing, both tantalising yet faintly disturbing. This feels like a distinctly Winter scent – of candies and warmth, of over-indulgence and sparkly wrapping paper where you’re tempted to feel what’s below the surface. Devised by famous perfumier, Daniela Andrier and described as ‘a cocktail of musks’, the surprise to me was how predominant the caramel and benzoin stickiness dowsed these out in the fragrance. If, indeed, they had been allowed to breathe a little, I may have been more inclined to fall in love with this. As it is, just like Prada’s mainline collection, I may have to defer to a later date. Prada Candy launches September 2011 and is available from £40 for 30ml EDP to £71 for 80ml EDP. Prada Candy also comes in shower, lotion and scrub. Please let me know if you’ve tried Prada Candy and what you think of the newest addition to the Prada range of fragrances.